To fully appreciate the aromas of Bourgogne wines, taste them at the right temperature. This varies according to the color and the appellation. In any case, to reveal the full delicacy of your wine, don’t serve it too warm or too chilled. Note that it’s better to serve your wine a little too cold rather than too warm. In fact, once a wine is in the glass, it warms up very quickly. To avoid heating it up any more with your fingers, hold your glass by its foot. Your Bourgogne wine is a subtle product. 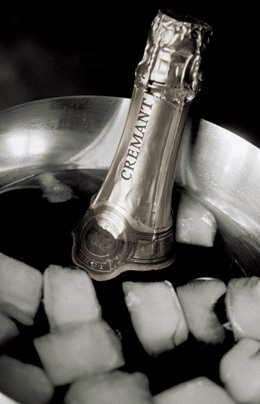 To savor its full palette of aromas, taste it at the right temperature. Above all, remember that heat is a wine’s worst enemy! For Jean-Pierre Renard, specialist at the Ecole des Vins de Bourgogne, “too high a serving temperature, above 18°C, will accentuate the burning side of the alcohol in the wine.” What’s more, if you drink your wine too warm, it will seem limp, in other words lacking in relief and vivacity. 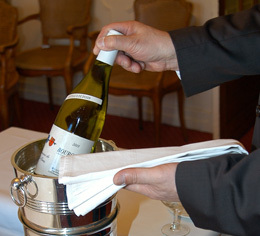 You should also avoid serving your Bourgogne wine too cold. If you are drinking a red wine, this will make it austere : it will be rather harsh, a little acidic, and will not be able to fully express its aromatic character. Similarly, excessive chilling neutralizes the delicate fragrances in white wines. What is the right temperature to appreciate the subtlety of my Bourgogne wine ? Their aromas of white blossom and citrus come through best at between 6-8°C. Serve between 10-12°C. This temperature suits, for example, a Bourgogne Aligoté: it will reveal its full aromatic bouquet, which is both floral (acacia, hawthorn) and fruity (green apple). o For a Vosne-Romanée, balsamic aromas (pine resin) and undergrowth (mushroom). “The right serving temperature is essential to fully appreciate the winemaker’s skill in the production of a wine. 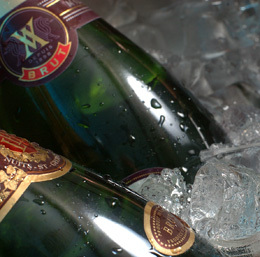 In fact, excessive warmth alters the balance in the mouth and only allows the alcohol content to come through. As for cold, it prevents you from enjoying the diversity of the aromas and the wine’s texture. So you should be very exacting about serving temperatures. This expression dates back to when houses had no heating systems. With their thick walls, they remained at a steady temperature of 16-18°C in all seasons. To chill or warm up a wine, all it took was to leave it to stand in the ambient temperature of the room. Nowadays, to chill your Bourgogne wine, you can place it for a moment in an ice bucket of cold water (with a few ice cubes if the weather is very warm) or in a refrigerator. Whatever you do, avoid freezing it, since this tends to “brutalize” the delicate aromas of Bourgogne wines.